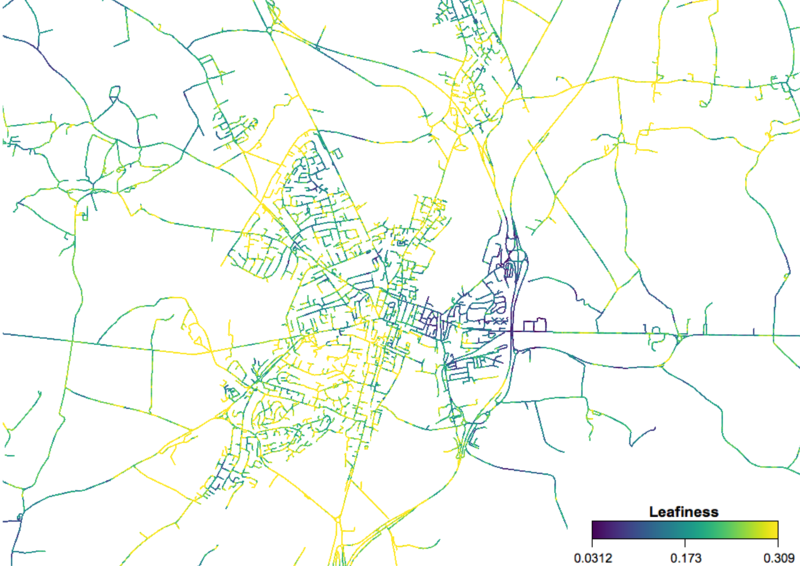 If you just want to see some pretty maps of roadside leafiness then scroll down…otherwise, start at the top to find out how I did this. I’ve recently started doing a little bit of satellite imaging work again, and started off with a project that was inspired by a post on James O’Connor’s blog. 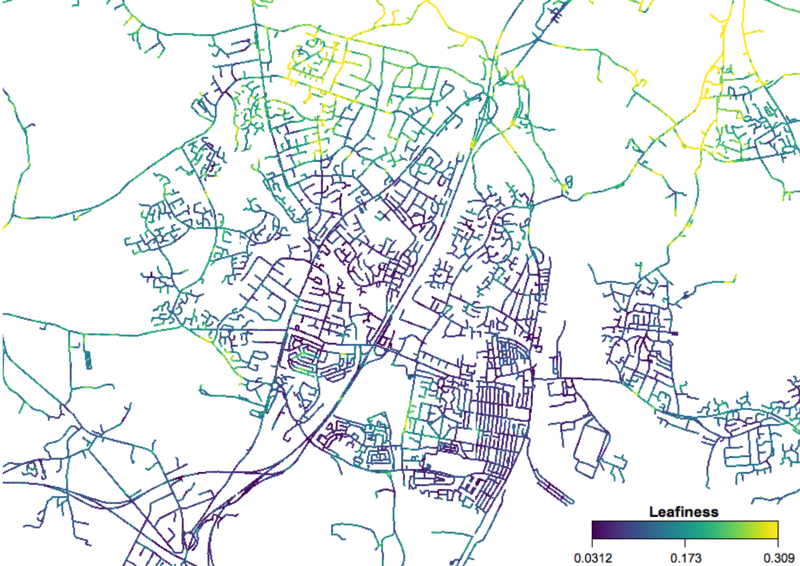 He posted about looking at the leafiness of streets in cities by extracting the NDVI (Normalized Difference Vegetation Index) within 20m of a road. He did this for Cleveland, Ohio using data from the Landsat 5 sensor, and produced a nice output map showing some interesting patterns. This caught my interest, and I decided to see if I could scale up the analysis to larger areas. My go-to tool for doing simple but large-scale remote sensing work is Google Earth Engine – a free tool provided by Google which can easily process large volumes of satellite imagery stored on Google’s servers. To use this tool you have to be a ‘registered tester’, as the tool is not fully released yet, but it is easy to register to become a tester. The code to perform the analysis is actually very simple, and is shown below. For those of you who have access to Earth Engine, this link will open the code up in the Earth Engine workspace. In summary, what we do is select all of the Sentinel-2 data for 2017, and take the pixel-wise median (this is a very crude way of filtering out clouds, shadows and other anomalies – leaving a relatively representative view of the ground). We then calculate the NDVI and extract pixels within 10m of a road (I chose 10m as this was more likely to just get vegetation that was at the edge of the road, and was possible as Sentinel-2 is a higher resolution sensor than Landsat 5). The easiest way to do this extraction is to create a raster of distance from the vector roads data (putting in a small maximum distance to search to increase computational efficiency) and then use this to mask the NDVI. Finally, we visualise the data on the map provided in the Earth Engine workspace, and download it as a GeoTIFF for further analysis. This further analysis was carried out in QGIS – and there are a few more posts coming on some issues that I ran into while doing the QGIS-analysis, and a few tips of useful GDAL functionality that can help with this sort of analysis. In this post I’m going to focus on the visualisation I did and show some pretty pictures. In the next post I will show a bit more quantitative analysis comparing leafiness across settlements in the UK. Anyway, on to the pictures. I used the viridis colourmap as this is generally a well-designed colourmap, and quite appropriate in this context as the high values are green/yellow. The first set of images below are all on the same colour scale, so you can compare colours across the images. You can see some interesting patterns here. There is a major area of high leafiness in the Upper Shirley area, to the west of the common, with some high areas also in Highfield and Bassett. Most of the city centre was very low – interestingly, even including the areas around the major parks – and most of the other areas of the city were quite low as well. There seems to be a relationship between leafiness and the wealth of an area, with relatively wealthy areas having high leafiness and relatively poor areas having low leafiness – as you’d expect. The area of Hiltingbury, at the northern end of Chandlers Ford, is very leafy – which definitely matches up with my experience visiting there! In general, the western side of Chandlers Ford is leafier, with the eastern side of Chandlers Ford having almost as low values as Eastleigh. In general Chandlers Ford is considered significantly more desirable than Eastleigh, so I’m slightly surprised that there isn’t more of a difference. The centre of Eastleigh is extremely low – as these streets are mostly terraced or semi-detached houses with little vegetation around (either trees or front gardens) – but again, I’m slightly surprised to see the hot spot on the west of Eastleigh. Winchester is completely dominating the area, with far higher values even than most rural areas. Again, this matches up with expectations given that Winchester is a wealthy city, and is known as a nice, leafy place to live. The rural area between Eastleigh and Winchester is also very high, as is – slightly surprisingly – the area around Bursledon to the east of Southampton. There is a significant east-west divide, with the estates of detached houses that have grown up on the west of the city having very high leafiness, and the older terraced and semi-detached areas on the east of the city having a far lower leafiness. So, there are some interesting patterns here and some pretty maps. In Part 2, I’ll look at some statistical analysis of leafiness across the England, Wales and Scotland, and then consider some of the limitations of this approach. Nice post and good to see you blogging again Robin! Despite some of it’s idiosyncrasies I’m constantly amazed at what you can do with Earth Engine. Now patiently waiting for them to provide atmospherically corrected L2A Sentinel-2 data. Something to note that I came across recently – if you filter an image collection like you’ve done here, you’ll lose any images collected on the last day of year. Unless you actually specify the time with the date, it will default to 00:00:00 rather than 23:59:59. Yes, one of my big issues with Earth Engine originally was the lack of atmospherically-corrected data. They’ve sorted that for Landsat now, just waiting for Sentinel-2. I hadn’t realised that I’d lost the last day of the year with that filtering – thanks for letting me know. Southampton isn’t a town – it’s a city.